For 15 years, Kristin Swanson Wilhite ’94 spent her days standing at her own espresso counter in a small white tent at 41 Dravus Street, about six blocks from SPU’s campus. For Wilhite, The Grinder was a business and a home away from home. For the community around her, it was a refuge. One customer called it “a steady anchor” for the lower Queen Anne neighborhood, and SPU students, faculty, and staff became Grinder regulars. Rick Steele, professor of moral and historical theology, visited The Grinder two or three times weekly for the whole 15-year run. “My stack of stamp cards — eight drinks per card plus one free drink — was nearly 3 inches thick when the stand closed,” he says. But 2010 has given Wilhite and her husband, Brandon Wilhite ’94, a new adventure: parenthood. Max Christian Wilhite, born January 10, 2010, has shown them it’s time to close the coffee stand. It’s a happy ending. That’s a relief, if you consider how many small businesses end the way The Grinder began — with disappointment. In 1994, Wilhite had applied for a job as a student ministry coordinator advisor on Seattle Pacific’s campus. But the director of Campus Ministries at the time — a fellow named Jeff Keuss — turned her down. That letdown became an opportunity. “I was able to do so much more ministry with The Grinder than I could have as an SMC advisor,” she says. Some customers were fanatically loyal. Some were comfortable enough to trust Wilhite and her helpers with personal secrets. And sometimes, they were just unusual. Kent remembers one man who was so delighted that “these places still exist in America” that he wrote his name on a Grinder magnet and then departed singing “God Bless America” at the top of his lungs. The last days at The Grinder were bittersweet — a time of many goodbyes, memories, and joyful introductions to Wilhite’s new number-one customer: Max. One look at him and you can tell he’s as crazy about his mom as any of her Daily Vitamin-takers have been. One after another, her customers have been asking: What will happen to the coffee cart? Wilhite has donated it to First Free Methodist Church’s youth ministry. Stopping by her new “office” — her home in Shoreline, Washington — I haven’t been through the door more than a few seconds before Kristin’s pouring me a hot beverage, laughing like she always has, and serving up my “daily vitamin” — except this time it’s a generous slab of home-baked chocolate cake. She admits that she’s new to baking. But it is, of course, delicious. Share your favorite story about The Grinder! 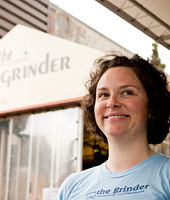 What do you remember most about your time at The Grinder with Kristin Wilhite? Read what others say. Posted Wednesday, May 26, 2010, at 1:13 p.m. I watched the Grinder open and sustain itself through the early years while my offices were located on Nickerson. I often travelled to the Middle East for extended periods of time, but my touchstone was Kristin and my "order"-- a double-tall mocha, which she remembered even when I had not been in for months. I knew I was home -- in a civilized and peaceful place. I also know that her prayers were with me when I travelled to some pretty wild places -- Baghdad, Cairo, and one of the most dangerous -- Paris. Always a smile and yet another story of "this guy", then a meet-the-family trip to Idaho, to "bliss" -- a marriage and a child. Way to go Girl!!! I'll miss our chats and especially the great coffee and you!! A friend as much as a barista extraordinaire!!! Posted Saturday, May 22, 2010,at 12:37 p.m.
Posted Friday, May 21, 2010, at 9:54 p.m.
Because I live a rather long distance from the Grinder I only visited Kristin a few times over the years. When I did make a stop there it was always 'exciting' and those of you that know Kristin know what I mean. She truly was glad to see me and who ever else was with me and although it was a quick in and out much was felt and received in a short time... that was and is Kristin gift, to utilize time effectively when she is in your company. Coffee was always excellent and you went away hoping to come back sooner than later. Love you Kristin, this stage of your life WILL be your biggest glory for you, cherish it all, time goes very fast. Hugs! Karen. Posted Friday, May 21, 2010, at 10:06 a.m.
For me, The Grinder has represented a home away from home and a safe harbor from life’s storms since I came to SPU as a freshman in 1998. During the involvement fair that first weekend at SPU, I filled out a card indicating that I was interested in being involved in a small-group Bible study. A short time later, I got a phone call from a Kristin Swanson, a recent SPU grad herself, inviting me to join her and two other freshman girls for a Bible study. So began a long friendship. Kristin and The Grinder have always been inextricably linked for me. If ever I needed a break, wanted to laugh with a friend, was seeking advice, or just longed for some much-needed prayer, Kristin was there for me, just a few blocks away at The Grinder. I knew I could count on Kristin to have a listening ear and whatever drink I craved. When I applied for graduate programs, she jumped to recommend me; when I was looking for work, she made calls to put in a good word for me; when I got married, she was there to celebrate; after my son was born, she was one of the first people to bring dinner to us and meet him. Throughout the years as a student and a full-time employee at SPU, having Kristin close-by at The Grinder has always been a great comfort and joy to me. And I have delighted in introducing as many people as possible to my favorite coffee shop and barista. While I will greatly miss The Grinder’s presence, I celebrate Kristin’s new exciting chapter with her!